Air Brush Tattoos are one of the most popular novelty items we offer. Children to adults will enjoy getting painless tattoos. 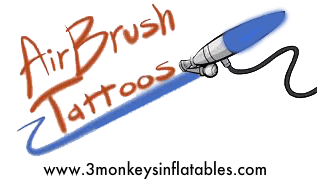 Our air brush artist will tattoo any one of 200 tattoos with up to five different color inks. Tattoos last 1 to 4 days depending on how it is cared for it. Tattoos can be removed with rubbing alcohol. These are great for picnics, carnivals, school, college events and more. This comes with a dedicated body artist and assistant to help clean the templetes in between.